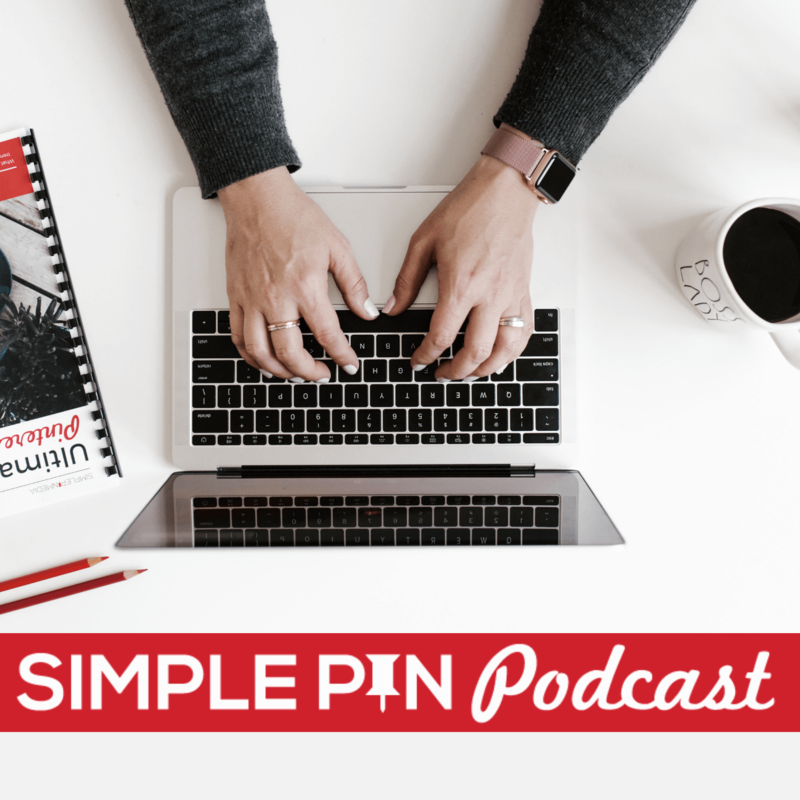 Our main goal here at Simple Pin is to take the Pinterest piece off of our clients’ plates so that they can focus on creating more awesome content for their target audience. In today’s episode I am talking to Melissa from Bless This Mess who has been a client of ours for the past 18 months. I asked Melissa to come on the podcast to discuss her long-term results on Pinterest. Melissa’s blog serves as the perfect example of the slow burn that is Pinterest. Melissa started her blog like so many people do – sharing recipes that people had asked her for at parties and family gatherings. But in 2012, after realizing that women were actually making a living blogging about food, Melissa bought a website domain that wasn’t part of her family blog and she started a real food blog. She wanted her site to be a place where busy moms could come to get the answer to the question, “What’s for dinner?” The site has evolved a bit over the past 5 years since she began. A love of family (she has 5 kids of her very own) combined with her love of food and all things dinnertime are what motivates Melissa to continue to provide “kid-approved” meals made from real ingredients. Her mission is to help moms avoid the drive-thru. Here at Simple Pin, we don’t focus too much on the number of Pinterest followers a client has simply because that number doesn’t always mean more pageviews or more income. But for the record, in the 18 months that Melissa has been with us, she has gone from 23,000 followers to 55,000. The great thing about follower numbers though is that they provide a form of social proof that can get you in front of more brands and bring greater opportunities for your business. When looking at Melissa’s actual blog traffic, the real story is told. When she began with us, Melissa was averaging 125,000 pageviews from Pinterest per month. She has now crossed over the 200,000 mark. When I met Melissa in person this past year at the Indulge Conference, she told me about a chocolate cake that she makes for her family every single week, but she doesn’t have the recipe on the blog because it doesn’t speak to her target audience. That really blew me away that she knew her market so well that she was holding back a recipe that her family loves that much. Melissa is quick to say that she is healthier on her blog than she is in real life. To clarify, her blog is less about being a mirror of her own life than it is a tool to help other women who are likeminded, but not her. Her target audience is busy moms who love whole foods. They respond more to quick and easy, healthy dinners than they do to desserts. So what she cooks for her family isn’t necessarily what she shares on her blog. The way she accomplishes this is by having designated kitchen workdays. She doesn’t ever make a meal for her own family, take pictures of it, and then serve it. She just can’t make that happen. What she does on her kitchen workdays is make 5-6 main dishes and then immediately take the photos of those meals. Her family is happy to eat off of the leftovers, or she may even give some food away, but it doesn’t coincide with family mealtimes. One of the big changes that Melissa has made recently is a complete redesign of her site. She wanted a more streamlined design so that visitors could see exactly what they needed as soon as they clicked over. She admits though to the change being difficult. Switching from the traditional blog design where everything is in chronological order felt scary. But she knew that she had hundreds of posts and recipes that nobody ever saw anymore. When it comes to blog photography, Melissa gave herself permission to do one simple thing – remember that she is not shooting for Country Living magazine. She is shooting for her blog, and while she would love to be in Country Living and while her readers definitely appreciate quality photos, she only needs three to four good shots of a recipe. She doesn’t have to spend hours taking shot after shot after shot, looking for the perfect one. Another thing that Melissa does differently than many food bloggers is that she rarely uses collages. She has many posts that have more than one recipe in them and her pin for those posts is one photo with all of the recipes in it. She wants to convey to the Pinterest follower that with one click to her blog they will get all of the recipes in the photo without having to click all around her site (check out this post to see how this works). With all the growth that Melissa has seen in her Pinterest followers and her site pageviews, I was curious as to how much her email list has grown. And in the four months immediately preceding this podcast recording, her list has grown 100%, up by 7,000 new subscribers. She does not send out an RSS feed of her blog posts, so the emails she sends are personally written by her for her list. She emails her list twice a month, and she does sell products via her email list. One of those is an ebook called 10 Healthy Dinners from Costco for Less Than $100. This ebook is actually for sale now, but Melissa is going to do a real launch during the back-to-school season. One of the ways that Melissa has used Pinterest marketing to grow an email list is by creating some special opt-in incentives. She went through her top 20 most popular posts on the blog and created opt-ins for them based on the content–things like grocery lists, meal plan calendars, etc. These opt-ins are spread throughout the posts. They help her email list to grow and they also served to increase her email open rate, which currently is at 30%. I said in the beginning that Melissa has been a client at Simple Pin for the past 18 months. So what is it that keeps her plugging away, even when her growth was slow? She freely admits to knowing exactly where the bloggers who started at the same time she did are now in terms of numbers, followers, etc. And she also says that comparison has stolen her joy more than she would like to admit. It’s easy to question why you aren’t experiencing the same amount of growth that others are. Melissa compares growing this business to motherhood; she has been in a building and growing stage for a while now, so that when her traffic did start to increase, she was ready for it. She has been refining her process for her blog for long enough that she knew where she was headed and how she wanted things to be before it got ahead of her. Continuing to learn new things, refining her goals, and narrowing her avatar have been most beneficial for her growth and being able to stay in it for the long-term. She isn’t interested in having one post go viral and then die. She wants steadiness and stability. The biggest piece of that has been figuring out who her audience is and then catering to them. It has helped her to be more successful, both on social media and on the blog. Figure out what brings you joy and hang on to that. If you are planning to make a career out of your blog, you need to love what you’re doing. Figure out how you can combine what you love with your target audience and mesh them together. I needed this! Right now all of my blog’s and social media growth is slow and steady. Sometimes I feel like its quitting time, but I know I need to press on….I have only been at it for about 9 months. I committed to at least 2 years when I started out and I can’t give up now! I always visit your sire as there are plenty of things to know and learn about Pinterest. i always struggle to manage my pinterest profile, as how many pins I should put there, who to follow and I find these answers at your site. Kate, this was SO much fun to do with you. Thank you for having me, you are awesome! Thanks for the post. I’ve been blogging about two months and the growth is reaaaally slow. I do love to write though so am holding onto that! Melissa’s encouragement speaks to me. I am a newer blogger, and it’s so easy to compare the numbers. I write about lifestyle and personal finance, and in the finance blogging realm, the numbers matter. I’ve had to take a step back and focus on who and what I’m writing. And why. Because I don’t want to lose my joy. I want to keep it and be doing this still in 2, 5, maybe even 10 years. Figuring out who I’m speaking to and working to help her, that’s been how I’ve seen my joy stay in the blog.